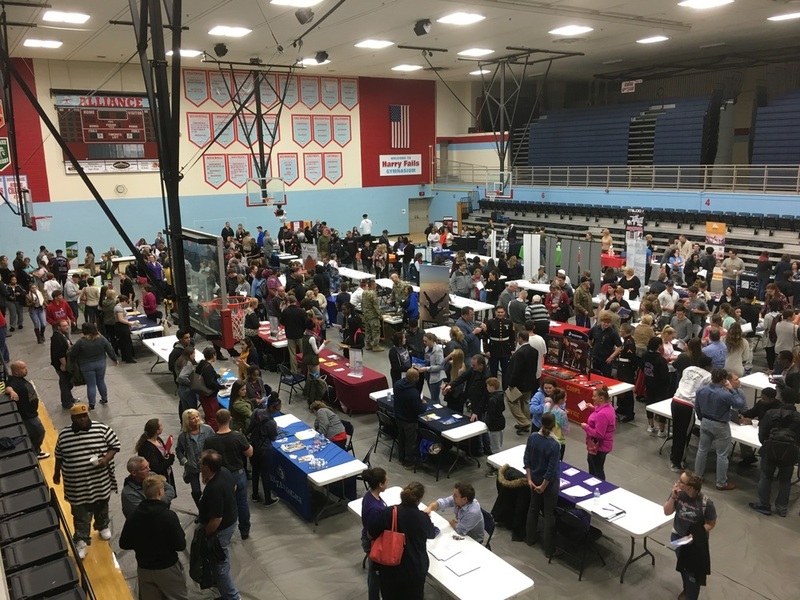 Post-graduation plans were in the making at the third annual College and Career Fair Thursday evening at Alliance High School. The evening event brought about 325 people through the high school on Thursday, November 9 to see what opportunities are available for ACS students. “We want to offer every resource we can for students to be able to reach that vision of preparedness for life, college and career after high school,” Allison Morrison, High School guidance counselor said. Students from middle school through twelfth grade attended an evening organized by the High School Guidance Department where they and their families could get all the resources for post-graduate opportunities in one place. On Thursday evening the guidance office staff also hosted a scholarship informational meeting for all parents and students at the high school, but especially the seniors, about each of the scholarships available to students. Last year over $1.7 million was awarded in scholarship money to graduating seniors. “I think a lot of people think scholarships are only awarded to the top ten students, but that’s not the case. We have scholarships for many different fields and different students, they just have to apply,” Morrison said. Information about scholarships is available to students on the district website or they can even sign up for text alerts when new scholarships become available. Principal Shawn Jackson said the scholarship meeting is an important part of the evening and it helps to continue the high numbers of students who receive scholarships at graduation. The College and Career Fair hosted over 55 vendors which include colleges and universities, employers, scholarship organizations, military recruitment and other businesses that can help students prepare to enter life after high school. Huntington National Bank will have a vendor booth and will be offering information about how to obtain loans and how to open a bank account. Goodwill Industries will be present to inform students about how to dress professionally and SARTA will discuss how to obtain transportation to jobs or school. The College and Career Fair also offered information to middle school students on up through eleventh graders about the College Credit Plus classes available for students.